This past year I am excited because I actually achieved a goal and dropped some pounds and lost some inches. My clothes fit much looser and I feel better. At one point my clothes were very tight, my blood pressure had elevated and I knew I had to do something. Once I hit age 50 I wanted to make a change. Now I have dropped 20 pounds and working on continuing my weight loss journey. I want to share what I did, my future goals and invite you to join me on this journey. As a Herbalist, the first thing many people ask me when they find out I’m into natural health is “what do you have for weight loss?” I am familiar with many great weight loss products. I have lots of healthy recipes I save. I love Pinterest for saving all the great recipes I see online (follow me on Pinterest): http://pinterest.com/wrightlady24/healthy-recipes/. I became interested in trying Zumba for exercise after reading about a woman on Facebook who went from a size 22 to a size 14. It also looks fun, so I looked for a local Zumba class. As an Herbalist there are two companies I believe in and use – Nature Sunshine products and It Works Global. Nature Sunshine is over 40 years old and have over 300 products. I use the ZYTO Compass Scan to help people get on personalized programs and I have been helping people with various issues from digestion, female issues such as fibroid tumors, high blood pressure, circulation, and to help people start a good detox program. The Compass scan helped me to realize I need to work on balancing my hormones. This was linked to my blood pressure rising. I take Cramp Relief which has herbs for the woman’s glandular system. The scan also recommended Garcinia Combination which is good for weight loss and to help balance blood sugar level. I also did a Taio He Cleanse like it suggested; a 15 day cleanse that is a combination of Chinese herbs that is balancing and helps cleanse the liver. The liver is a filter for the body and important in weight loss. I highly recommend my clients start their weight loss program with a good detox/cleansing program. I plan to continue my program doing the 90 day colon cleanse or the Cleanstart program; a pre-packed cleanse for 14 days. Then I want to do a Para-cleanse to cleanse parasites from my system. Cleansing is important because it helps to clean up your past. The standard American diet consist of lots of cheese, which is mucous forming, white sugar and other processed foods. These foods tend to stick to the colon and build up after time. You want to do a detox program at least twice a year or every season. Diseases start in the colon. While I was in school for Massage Therapy I learned about a company named It Works Global. A woman named Lisa Jennett Wood, who is now my upline and business partner asked me on Linkedin if I ever heard of the Skinny Massage. That opened my ears, especially after she explained it dealt with all natural, botanical ingredients. I went on to learn about the body applicator which is an herbal wrap that you wear around the tummy area for at least 45 minutes or more, then when you remove it you can actually see an improvement with your skin tone and some even drop inches. I gained all the knowledge I could with this product. I have tried the body applicator and I did actually drop 1 inch with my first wrap. To get the best results add dry skin brushing and drink lots of water for the next three days from wearing the wrap. The natural ingredients removes toxins and inflammation from the fat cells, causing them to shrink. It also tightens, tones and firms the skin. When you add the Skinny Massages to this routine you can see improvement with the appearance of cellulite. I’ve seen amazing results from people who wrap weekly until they reach their goals. For anyone thinking of liposuction or other surgeries I highly recommend this simple procedure first. You can order the body applicator, the defining gel, stretch mark cream and even supplements for weight loss right from my site: margueritewright.myitworks.com. In December I took the training for the Skinny Massage and I am now available to offer this treatment. If you are in the Chicago area contact me to schedule your appointment. I can travel to you or I work from a salon in Homewood, IL. I think the main thing you want to do is find something you enjoy to burn those extra calories. I love Zumba it is so much fun and I really work up a sweat when I do a hour long Zumba class. I go to KS Holistic Fitness in Beverly area of Chicago. I was attending classes 3 times a week and the weight began to fall off. I also feel how my endurance has increased. I want to go to classes at least 5 times a week now and plan to do that when I sign up for the next session of classes. KS Holistic Fitness also offers Belly dancing, Yoga and more. When I can’t get to KS Holistic Fitness I go to Youtube or workout to my DVDs. Yoga is great for stretching. I find people forget to stretch out their bodies and end up very tight. I can always feel in my client’s muscles when I massage them if they stretch out regularly or not. We have to learn from our pets. You ever noticed how your cat or dog stretches out as soon as he or she wakes up? So sign up for your local fitness class of choice and try to fit it in your schedule at least 3 times a week, then try to increase it to 4 or 5 times a week. You will see the results! Remember exercise adds years to your life and improves heart health. You want to do aerobic exercise and work with weights. It can be very difficult to eat healthy in today’s economy. I face the challenge of feeding a family of five with my husband and our three growing sons with very large appetites. We try to include the proper amount of fiber in the diet. We eat oatmeal regularly for breakfast. Fruits and vegetables are important. I like to prepare lots of healthy salads like Creamy Kale Salad, Tabbouleh, and regular garden salads. Cutting out processed foods and soda pop is something we’ve worked on. I make herbal teas and add lemon and natural sweeteners like raw sugar. I also learned I have to eat more to rev up my metabolism. I actually blogged on that topic earlier – I learned I have to eat more to loose. I hope my experience helps others. Please join me as I continue on my weight loss goals. 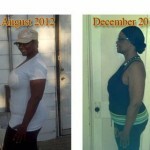 Share your weight loss success stories at this blog post below and continue to follow me. Contact me if you are interested in the ZYTO Compass scan and the Skinny Massage.